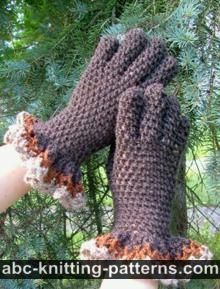 If you're noticing the cold creeping up on you, it might be time to get to work knitting a lovely pair of gloves like this one. Of course the colours are interchangeable, just ensure that you've run those changes throughout the instructions or things can get confusing. Who knows, you may just give up those Ralph Lauren leather numbers in favour of your warm, cozy, knitted pair. 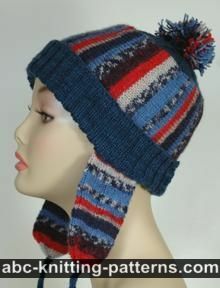 Cast on 40 sts on double pointed needles with yarn B, join in a circle and knit in rounds like socks. Rnds 27-47: yarn A, stocking stitch. Rnd 48: Transfer 6 middle sts from 1 needle to a safety pin for the thumb. Rnd 49: Cast on 6 sts with the simple cast on over the sts transferred to the pin. Rnds 50-69: stocking stitch. Transfer all the stitches to 2 large safety pins. 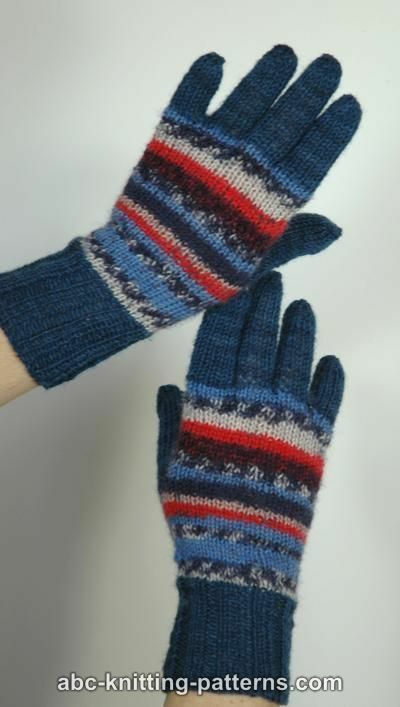 Fingers are knitted on 4 double pointed needles. With yarn B transfer 12 sts from the safety pins (6 sts from each) to 3 double pointed needles and add 2 more stitches by knitting into the front, the back and the front of the 12th stitch (14 sts). Knit stocking stitch for 24 rnds. Rnds 25-27: decrease 1 sts on each needle in each round. Cut yarn, leaving a 5" (125 cm) tail. Pull through remaining sts and secure. With yarn B transfer 5 sts from the safety pin, pick up 2 sts from the first row of the finished finger, transfer 5 sts from the other safety pin and add 2 more stitches by knitting into the front, the back and the front of the 5th stitch (14 sts). Knit stocking stitch for 26 rnds. Rnds 27-29: decrease 1 sts on each needle in each round. With yarn B transfer 5 sts from the safety pin, pick up 2 sts from the first row of the finished finger, transfer 5 sts from the other safety pin and add 2 more stitches by knitting into the front, the back and the front of the 5th stitch (14 sts). Knit stocking stitch for 24 rnds. With yarn B transfer 8 sts from the safety pins to 3 double pointed needles and pick up 3 sts from the first row of the ring finger (11 sts). 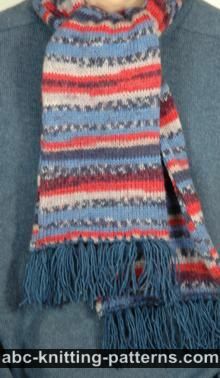 Knit stocking stitch for 22 rnds. Rnds 23-25: decrease 1 sts on each needle in each round. With yarn B transfer 6 sts from the safety pin, add 2 more stitches by knitting into the front, the back and the front of the 6th stitch. pick up 8 sts from the 49th rnd of the body, add 2 more stitches by knitting into the front, the back and the front of the 1th stitch (18 sts). Knit stocking stitch for 22 rnds. Sorry but where are the instructions/grid for the fair isle? 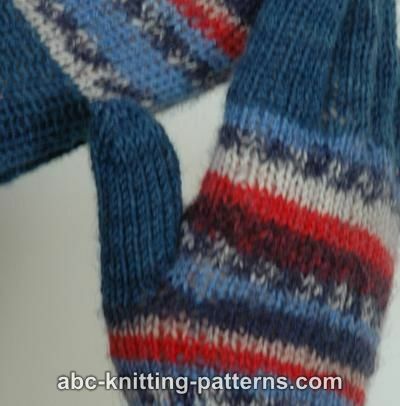 The pattern calls for the self-striping sock yarn, which imitates Fair Isle pattern.